Happy, joyful, beautiful, wonder-filled 2018! Here’s a little weekly list for anyone interested in wonders, discoveries, simple and complex joys, cool stuff, and at times mind-blowing technologies (at least in my opinion). It’s a rapidly changing world, more than ever, and it’s only moving faster. So here’s a spot where I’ll share what I find and you can share right back. This will evolve over the year, but I’m stepping in imperfectly because that’s kept me from doing it for a very long time. I’m going to give it my best to send this out every week of 2018. No promises except to try my best. Here we go! One human wonder, did you see this? Space! If you love to imagine exploring the galaxy (maybe like me, you stared upward as a child and hoped Luke Skywalker really was out there), then you might be as excited for 2018’s space plans. Dang, I turn into an excited, 8 year old over this stuff: a tourist trip around the moon, continued rocket launches, plans for Mars. One favorite happy tears story of the week: Teachers hugely impact children’s lives. This one gave the gift of life. 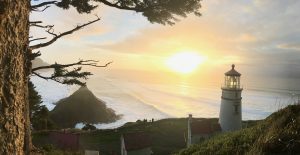 One favorite experience of last year: Family trip to Heceta Head Lighthouse. I hope the novel that my daughter Maddie and I wrote in this location will be coming out this year or soon after, but our return to the Oregon coast was amazing! 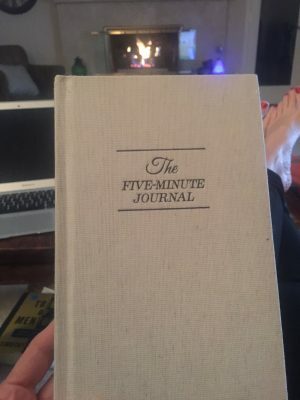 One favorite find: The 5-minute Journal is pretty famous already thanks to @TimFerriss, and as I’ve started it this week, I can see why. It takes a few moments morning and night, and it’s wonderfully impactful. One thing in tech: I wrote this article last year and was amazed to learn that people who deal with depression and anxiety are being helped by AI (artificial intelligence) implemented through chatbots apps (think robots without bodies that communicate on a phone or computer app). Your thoughts? If we are children of God and created in His image, our thoughts and words have enormous power. God speaks and things are created. Ponder that with me. It makes me really consider my words and thoughts! If you’ve found something interesting that you’d like to share, please do. And if you want to get this in your inbox and didn’t, sign up on my website, email me your address, or use the contact form. I won’t use your address for evil (or good – won’t use it at all except for this) and eventually, I’ll be sending all subscribers something extra (ebook, info graph, something of value). FYI, some product links are affiliate links. Okay, I did it! Onward into week 2 of 2018! May it be blessed for all of us!